You can return to our english daffodils page or browse the pictures using the next and previous links. Yours are lovely Spritz. This is the same variety that I have but mine are not flowering yet. Great to see them out, mine are still no where near. Lovely splash of sunshine in the dark! Sorry about the flash - I was still outside as the light was going! Tulips? You've been weaving magic spells again! They're doing well. I've got one little Tulip it's head is out and flowering but at ground level. They are dwarf Tulips but this is ridiculous. No, Wagger - they're the ones I bought in little pots - remember? To replace the ones that the badgers ate? Then along came the rabbits and had another good meal - but I have juuuussssttt a few left! Gardengirl - that's odd - I wonder if it's hiding from the cold wind!!! LOL. Thanks for the reminder - I need these more and more regularly, lol. Well, this has been one experience I'm not likely to forget, certainly! 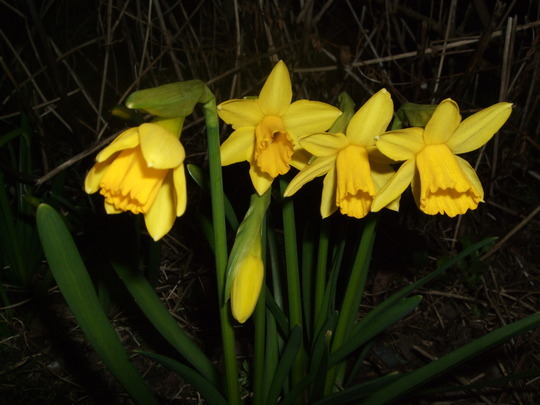 This photo is of species Narcissus Tete a Tete.